I've been trying out a couple of different baskets to put my Easter goodies in. 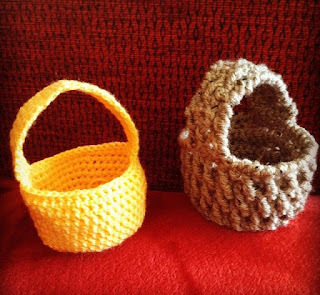 The brown one is a tutorial from Olivia @ Girlybunches. I used Aran wool and a size 6mm hook. I was quite surprised by how easy it was to follow the tutorial, I'm only a novice when it comes to crochet but thanks to the wonder that is YouTube I'm getting a little more adventurous with my stitches. I've also decided to join the The Splendid Sampler Quilt Along. There are two 6" blocks a week using lots of different techniques. I'm hoping to get the first four blocks finished this weekend and post some pictures next week. Have a great weekend and enjoy whatever you have planned. Oh man...I missed the cut off for the Easter swap. That's what I get for not being on top of all the goings on with h my bloggy friends. Enjoy your swaps, my friend. Aww, the baskets are so cute. I can't crochet to save my life!